It's unclear how long or why the girl was dangling from the gondola at Six Flags Great Escape in upstate New York. In the video, a girl wearing blue shorts and a gray shirt can be seen dangling from a stopped gondola. 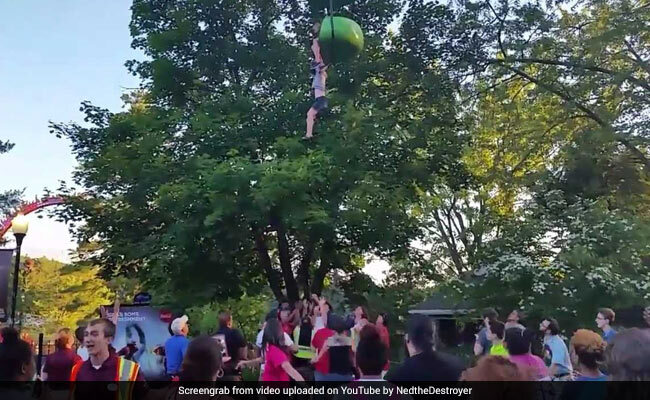 A teenage girl escaped serious injury Saturday evening after falling 25 feet from an amusement park ride in upstate New York - and into the arms of a crowd that had gathered below to catch her. The dramatic fall and rescue was captured on video by at least one bystander at Six Flags Great Escape in Lake George, New York, about 60 miles north of Albany, where the incident took place. "I was sitting there waiting and I heard the people screaming," Loren Lent, who witnessed the incident, told The Washington Post. He said he had been standing nearby waiting to photograph his own family members, who were in a later gondola on the same ride. "That was a very good idea," he said. "It was just good to see people band together to do what they could do." After several moments, Lent can be heard in the video yelling: "They'll catch you! They'll catch you, honey, go ahead!" It was then that the girl plummeted to the ground, hitting a tree branch before being caught by several people below. The video showed onlookers cheering after the girl was caught and then the girl being carried away, limp. The girl who fell was a 14-year-old park guest visiting from Greenwood, Delaware, according to a statement from the Warren County Sheriff's Office. She was treated by park emergency medical staff first, then taken to a local hospital and finally flown by helicopter to Albany Medical Center. She remains in stable condition with no serious injuries, police said. A 47-year-old man visiting the park from Schenectady, New York, was also taken to a local hospital for a back injury he suffered as he tried to catch the girl, police said. Lent, who later uploaded video of the incident to his Facebook page, said it was "horrifying" to witness. He estimated the girl had been dangling for at least 90 seconds and possibly even a few minutes. "There were a lot of people yelling and surprised as I was that there wasn't something that could be done faster to help," Lent said. He added he was also alarmed that the girl, after being caught, had to be carried about 30 feet to a waiting golf cart to receive medical attention. "If there's possibly neck or back trauma, you want to immobilize (the person)," he said. Police described the "Sky Ride," the attraction from which the girl fell, as a "very slow-moving, gondola-style attraction that spans several hundred feet across the park." After receiving a call that a rider was in distress, park staff stopped the ride, police said. It's unclear how long the girl was dangling from the gondola. Investigators and park staff inspected the ride, including the gondola the girl had been in, and found that "everything was in proper working order and all safety equipment was intact and operational at the time of the incident," the sheriff's office said. However, "out of an abundance of caution, the ride will remain closed while we conduct a thorough internal review," Wood said. When asked whether the girl's evacuation from the ride had followed protocol, Wood did not specify but said that all rides have a "standard evacuation plan." "As part of our annual practice an evacuation drill is conducted in partnership with local emergency personnel on this particular ride each spring," she wrote. "Every situation is unique and requires the appropriate time and tools for the evacuation. We are reviewing our internal procedures to ensure the safety and security of our guests and team members."